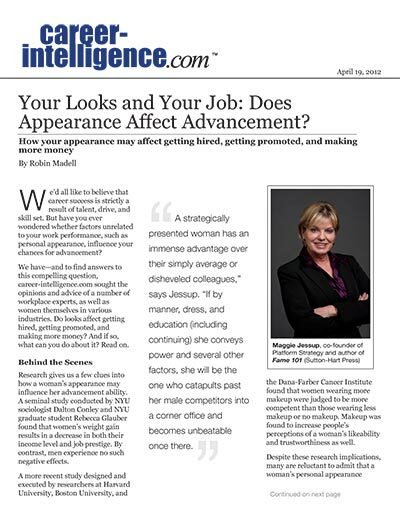 Your Looks and Your Job: Does Appearance Affect Advancement? We’d all like to believe that career success is strictly a result of talent, drive, and skill set. But have you ever wondered whether factors unrelated to your work performance, such as personal appearance, influence your chances for advancement? We have—and to find answers to this compelling question, career-intelligence.com sought the opinions and advice of a number of workplace experts, as well as women themselves in various industries. Do looks affect getting hired, getting promoted, and making more money? And if so, what can you do about it? Read on. Research gives us a few clues into how a woman’s appearance may influence her advancement ability. A seminal study conducted by NYU sociologist Dalton Conley and NYU graduate student Rebecca Glauber found that women’s weight gain results in a decrease in both their income level and job prestige. By contrast, men experience no such negative effects. A more recent study designed and executed by researchers at Harvard University, Boston University, and the Dana-Farber Cancer Institute found that women wearing more makeup were judged to be more competent than those wearing less makeup or no makeup. Makeup was found to increase people’s perceptions of a woman’s likeability and trustworthiness as well. Regardless of whether looks are a hidden persuader or a more overt one, many women are aware of being judged by them in the workplace. If you want to know whether women think their looks are important at work, ask a dermatologist. Debra Jaliman, a board-certified dermatologist and author of Skin Rules: Trade Secrets from a Top New York Dermatologist, says that many of her patients spend substantial sums of time and money to try to look younger and better, specifically because they believe it affects their chances for job advancement. “Just recently I had a woman come into my office and tell me that she was fired and given a great severance package after 17 years of work because she didn’t look young enough,” says Jaliman. “She is 50. She said that she would spend some of this money on anti-aging treatments so that she could reenter the work force.” A number of New York-based plastic surgeons echoed Jaliman’s observation of women’s concerns about appearance in the workplace. Another peek behind the scenes comes from Margaret J. King, Ph.D., director of the Center for Cultural Studies & Analysis, a think tank that studies human behavior, including gender and appearance issues. Kings says she hears from employers constantly that candidates don’t spend enough time thinking about how they are coming across in interviews or later, if they get the job, how appearance affects them in the workplace. “Appearance is always a factor in primate hierarchy—how we approach others and think of them in our internal mind mapping of people and prestige,” says King. Priya Sharma, marketing head of Recruiterbox, attributes this edge of the sword to what she terms “work-life jealousy.” Sharma says she has seen many women who express jealousy and envy toward other women based on their appearance. Based on this jealousy, some women use their authority and influence to suppress other women in the workplace rather than helping them to advance. As a younger woman, advertising photographer Hannah Ross has found it necessary to modify her looks “in reverse” when meeting with new clients. Instead of trying to maximize her youthful looks, Ross tries to downplay her looks to make herself appear older. “I’ll pull my hair into a tight bun and wear no makeup, or accentuate any kind of bags under my eyes and crows feet,” says Ross. “Appearing as pretty does not help in any way because it supposes youth and inexperience.” Ross says that although it’s frustrating to have to “misrepresent herself” in this manner, she feels it is necessary to be taken seriously in her industry. To help create that consistent brand while avoiding both blades of the attractiveness “double-edged sword,” women need to be strategic. Maggie Jessup, author of Fame 101: Powerful Personal Branding and Publicity for Amazing Success, says that at the managerial/executive level, in contrast to administrative positions, personal appearance becomes a powerful factor in hiring, promotions, and earnings. Yet it’s not all about physical beauty, which as noted previously can itself sometimes be a negative in those areas—it’s about presenting yourself strategically.